Groundbreaking music production system for tactile, creative beatmaking. In this YouTube video, Dow Jones and Henny (Tha Bizness) rely on MASCHINE, describing their process: "[We] basically went in Maschine, started going through the samples. If you listen to the track stock, it would sound completely different. 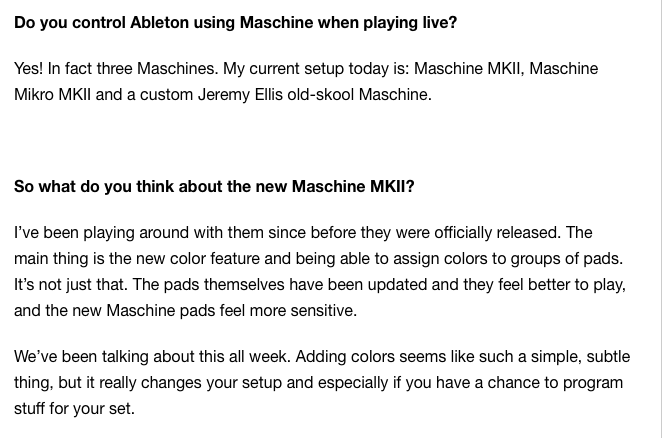 But we used Maschine's internal effects to… just to really beef everything up and kinda make our own sound. We load in our own drums. Did a simple arrangement with nothing added, no effects or whatever." "People always ask, when I get Maschine what sounds does it come with? It comes with a lot of sounds but the greatest part of Maschine to us is that you can record whatever you want in it. Then we add effects. This was the first time that we recorded live instruments into Maschine, instead of how some people might take live instruments and record them straight into Pro Tools." From his featured article in MusicRader: 'It's no surprise to see Maschine in Flume's studio but, as yet, he hasn't really got the most out of it, he tells us. “I’ve never really learnt it properly so I don’t tend to use it that much,” he explains.' This model of Maschine must be the MKII because it has one large knob on the left side, while the MKI has three smaller knobs in that location. In this Instagram photo of Kill Paris' studio setup in Boulder, CO, one can see a white Maschine MKII on the right of the desk. In this video, Ean demonstrates how the Maschine can be synchronized with Traktor to perform various tasks in live performance. The left side of the unit has one large knob instead of three smaller knobs, so it is distinctly the MkII model. In this photo her instagram page, shown maschine. "Thanks Native Instruments for the early Christmas gift!" In this Instagram photo, captioned, "Anyone like to customize their toys too? #maschine #gearsluts #drummachine", DJ QBert shares his customized Native Instruments Maschine MKII. In this video from the *Vans* series "OTW PERSPECTIVES", at 1:43 Lunice's has a Maschine MKll on his desk. In his studio, there is. In this photo he is using. You can see the Maschine at 1:19 next to the Jam in the attached video. Josh Carter is shown in the music video For "Fall In Love" by Phantogram using the Maschine throughout the whole set. "New toy 4 tha studio"
got these in the mail today -- almost made me forget i'd just sent in my taxes. thanks @nativeinstruments !! Using it here for a live stream, by the looks of it. In this video you can see El-P using the Native Instruments Maschine MKII at 5:55. At 4:11 of this video, DJ Shiftee is seen with his Maschine MKII, and states, "I'm also using Maschine to control Traktor." In this article you can see several pictures of his Maschine MKII. He also states: "There are tools I use, like the Ableton Push, Maschine, and a synth called Analog Keys." In this Instagram photo, DJ Hard Rich includes his Native Instruments Maschine MKII. Jeremy Ellis says, "Yes! In fact three Maschines. My current setup today is: Maschine MKII, Maschine Mikro MKII and a custom Jeremy Ellis old-skool Maschine," in [this interview](http://www.askaudiomag.com/articles/interview-jeremy-ellis-on-finger-drumming-maschine-and-mostly-robot), when asked if he uses Maschine to control Ableton when playing live. Maschine MKII can be seen in this picture. In this image, from [this article](http://www.attackmagazine.com/features/my-studio/sebastian-mullaert-aka-minilogue/), on Sebastion, his Maschine MKII can be seen. Groove production studio software including hardware controller. In this picture, Shura can be seen using a Native Instruments Maschine MKII. "I got my Machine with me, where I can play live drums to it"
"NI Maschine is the heart of my live performances"
This item can be seen at 1:17 in the video. Troughout this video, you can see Shaun Frank using a NI Maschine Mk2. He posted this while he was in a hotel. You can tell it's Maschine MKII compared to MKI is it has the new encoder wheel, multicolour pads, new display (light blue text on a darker blue background. But in the picture it's different which is probably due to camera image). In response to a question posted on Skrux's official FB page, "What VST do you use?" Skrux: "I use NI Massive, NI Maschine, and a few others"
In this page, there is machine in his studio. Here is the site of studio where Sir Michu works. He is using most of the instruments, and gear from the "Dane techniczne" list. In these picture, you can see he has the Maschine MK2 from Native Instruments. A little behind the scenes on "Bullet Train"
The item can be seen at 6:31 when sleepy brown is playing on it. He has also incorporated music production workstations such as Maschine and Pro Tools. Petit Biscuit is using this gear in this video. Suga uses the NI Maschine MKII in his review to create a beat using samples. Used in studio and live sets. MASCHINE MK2 is the second edition of Native Instruments' highly respected groove production system and it comes stacked with numerous enhanced workflow improvements for an even more intuitive experience and faster performance. MASCHINE lets you effortlessly produce beats, melodies, and harmonies with powerful drum synths, premium sounds, an integrated sampler, and more – cutting-edge software meets intuitive hardware for ultra-smooth workflow. MASCHINE’s multi-color pads provide ultimate feel in the thick of the beat. Dedicated group buttons and a master push encoder deliver hands-on control of sounds and key parameters. And eight display knobs automatically map to key instrument parameters for on-the-fly, two-handed tweaking and sound shaping. The included MASCHINE 2 software is exploding with cutting-edge technology. Improved browsing, arranging, and sampling, plus a new mixer, plug-in strip, and exclusive drum synths. Get ready for the most responsive, fluid, and musical beatmaking experience ever. MASCHINE 2 extends Keyboard Mode with a new scale and chord engine – fully integrated into the MASCHINE workflow. Simply select your scale and start playing melodies on MASCHINE’s 16 ultra-sensitive pads that are always in key. Engage Chord Mode and play chords directly into your compositions. MASCHINE 2 extends Note Repeat into a fully functional arpeggiator. Play any number of notes and let MASCHINE turn them into a melodic pattern. Use the arpeggiator in combination with Scale and Chord Modes and get polyphonic performances from just one key – always in tune. What’s more, the output of the arpeggiator is recorded into the Pattern Editor – perfect for post-performance editing. MASCHINE 2 gives you full keyboard functionality within the MASCHINE environment. Press browse on your KOMPLETE KONTROL keyboard and the KOMPLETE Browser pops up on your computer screen, letting you select and load a sound directly into a sound slot in MASCHINE. Watch scales, chords, and arpeggios light up across KOMPLETE KONTROL’s Light Guide™, see the color of your sounds in MASCHINE directly on the keyboards, and get perfectly mapped parameters instantly with Native Map™. KOMPLETE KONTROL continues its evolution with Native Kontrol Standard® (NKS). NKS is Native Instruments’ extended plug-in format that opens up the KOMPLETE KONTROL system. It allows VST and KONTAKT instrument developers to integrate their plug-ins with KOMPLETE KONTROL and MASCHINE at the same deep level as KOMPLETE Instruments. This means that even instruments not built by NI can be fully integrated in the KOMPLETE KONTROL and MASCHINE browsers, with instrument parameters intelligently mapped straight out of the box. NKS instruments can access the Light Guide, Smart Play features, and the full creative potential of KOMPLETE KONTROL. And what’s more, the NKS version of an instrument will be a free update for existing owners. If you are purchasing, or already own a MASCHINE Series product, you qualify for special pricing on KOMPLETE 10 and KOMPLETE 10 ULTIMATE. Unlock the full potential of MASCHINE by combining it with the worldwide industry-standard instrument and effect suites for production, performance, and sound design. These two collections of advanced software instruments and effects not only give you a wealth of sound to choose from – they also fire up your imagination. And MASCHINE Series Groove Production Controllers open up their full potential. Just got it, still learning how to use it. We use MASCHINE as a sampler, drum machine, and a controller for remix decks when DJing with Traktor. MkII brings colour to the party and extra responsive pads and buttons that click so you know where you are at without having to LOOK. Superb in standalone. I've owned the MK2 for about a month now, and every time I think I'm starting to get the hang of it all I find new functions and features that make it seem like a brand new toy again. There's a preset for just about anything you could ever want, or you can get lost shaping sounds in Massive & Prism. I use mine with an M-Audio Oxygen 25 midi keyboard, which gives me all the pads and keys, tempos and pitches , all together & built from a single sound. I love it! Damn good beat making system. pair it with a Komplete keyboard and you could create any sound imaginable with much more ease & precision. Use this to produce music. Ive used a bunch of other drum machines. At first, Maschine MKII was difficult to learn how to use. I even ignored it at times because it frustrated me. But as time went on, I found myself turning to it more and more. Relying on it because it was capable of doing what I wanted to do musically. Its QUALITY. Its not perfect but its fairly close. Get past the learning curve and theres not a better drum machine on the market- Maschine is my go to for evoking beats. This is an absolute beast at making beats with... amazing!!! one of the best studio equipment's I've ever purchased. The quality and sampling options on this maschine is absolutely amazing. It's great. But not perfect. It's the safest and practical buy for a pad. I do a lot of vinyl sampled hip hop beats, and this is great for that. I lay down drums and samples, then send it to Ableton to add more. It needs a computer with NI software to utilize it to it's fullest. But I already knew that, so that's not a big deal. All drum pads now are gonna be controllers with computer software. Good thing is it has more to it than just a plain old drum pad controller. Pros: -Comes with software and a plethora of popular instrument plugins. Not just only a pad -Easy to learn and makes workflow more efficient - I personally like the sampler and drum rack feature on the Maschine better than Ableton's. -It's popular, in which case it'll be easy to find tutorials to help troubleshooting -Less screen looking and mouse clicking. A heads down controller. -sleek -Awesome pads -Can work great as a live performance tool, with other DAWs like Ableton. -Crisp Sound -If you registered your Maschine, but didn't like it, then you're not screwed. You can unregister it and take it back. In sum, it's overall a great buy with a little bit of petty cons. But face it. Everything you buy is gonna have it's downsides. It's efficient and easy to use. So for you starting producers, I recommend getting this. But remember, it's not a DAW. If you have a DAW, then this will be great to combine it with. So for you newbies, I really consider having a DAW with this or getting one later on if you want to fully produce tracks. A cheap set of keys will help to. I have always Wanted a mashine for the live beat making and then i got it! (did not buy it got it from a friend) Its a Bit pricy but man Its Great! BEST SOFT DRUM MACHINE OUT THERE! My Maschine revolutionized my workflow, taking it from 0 to 100 in a matter of minutes. The intuitiveness of the software combined with the versatility of the hardware is unparalleled. The Maschine is a must for beatmakers-- if you're serious about your drums, this rig is for you. This is one of my favorite machines ever. The effects are awesome. They are very fit for a lofi producer. I think the compressor is my favorite on it. If u want something cool, and lights up, GET A MASCHINE NOW!!! As someone who never learned how to properly play instruments, the Maschine is just amazing. The software is incredibly easy to use. It integrates beautifully with Ableton Live. Before I got a Maschine I was lucky if I could complete a song at all. Ever since my purchase two years ago I've been using it nearly every week. The pads feel great and are upgradable, the entire controller can be used as a MIDI controller for pretty much anything. The screens are great if you want to keep your eyes off the computer. Its really Fantastic workstation!! We can enjoy so nice feeling of verocity on the pad. Easy to make the track. Gets you going, expandable, fun to use, cool/futuristic sounds, cool lights, a tad expensive but worth it! Sounds great, as much fun as it is challenging. The preset sounds are fantastic. But, it's the user interface that is the crowning jewel here. The array of instrument grouping, patters, scenes, etc. introduces many possibilities in terms of workflow. Sampling audio, chopping it down and assigning to pads is easy and awesomely fast. In the beginning, it was seemed enough rope to hang myself with. A couple months later, I'm loving it.